We enjoy salmon so often and yet, we know nothing about trout. In fact, trout has often been labeled as salmon trout in the consumer market to latch on to its more popular family member, the Salmon. A recent invite to the Norwegian Fjord Trout workshop was such an interesting event. 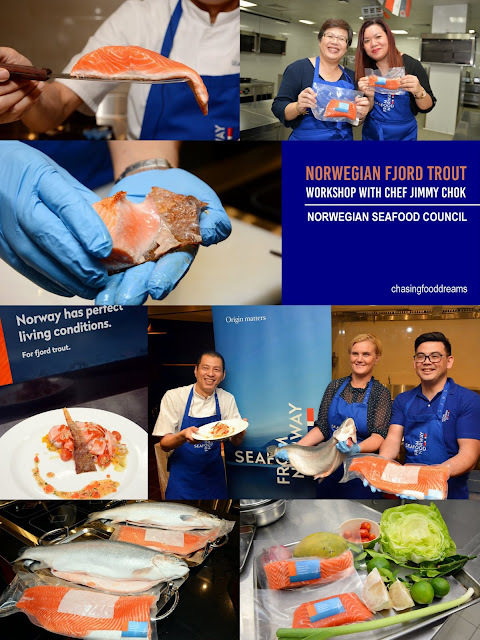 Thanks to the Norwegian Seafood Council, members of the media and bloggers were treated to a hands-on cooking workshop showcasing the versatility of cooking with Norwegian Fjord Trout with Chef Jimmy Chok at the KDU University College in Shah Alam. The workshop kicked off with video presentation of where Norwegian Fjord trout was farmed, followed by some interesting facts about the Norwegian Seafood Council and Fjord trout by Jon Erik Steenslid, Director, Southeast Asia, Norwegian Seafood Council. The Norwegian Seafood Council (NSC) was established in 1991 and has approximately 60 employees globally. Owned by the Ministry of Trade, Industry and Fisheries, the council monitors the seafood export for Norway. Norway is the second largest exporter of seafood in the world and also the world’s largest producer of farmed Atlantic salmon. With a staggering number 2.45 million metric tonnes of seafood exported to over 146 countries in 2016, seafood is one of Norway’s most important export commodity. Farmed Fjord trout and Atlantic salmon are fed special NON GMO pellets made from vegetable and marine ingredients, ensuring safe and nutritious consumption of the fishes. Jon Erik also highlighted that Norway has the perfect living conditions for Fjord trout, being surrounded by ice-cold waters with fjords stretching deep into its coastline. Farmed in the ocean, in the pure cold Norwegian fjords where seawater meets fresh meltwater from the glaciers and snow, consumers are assured that seafood from Norway, especially Fjord trout, are being farmed in excellent conditions best suited to them. The event was also graced by the presence of Her Excellency Gunn Jorid Roset, the Norwegian Ambassador to Malaysia. An avid trout lover herself, Her Excellency expressed her enjoyment for trout just as much as salmon and is happy to be able to enjoy Norwegian trout and salmon while living in Malaysia. 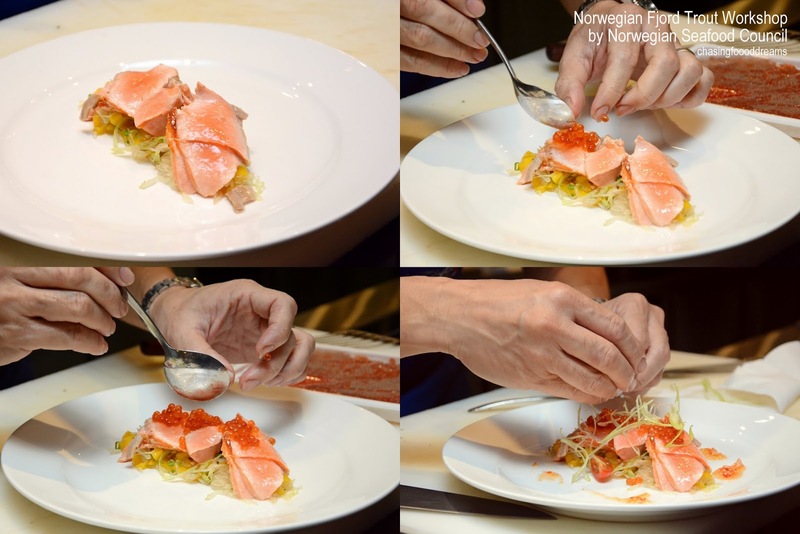 Norwegian Fjord Trout has indeed become a popular choice with Malaysian consumers unknowingly, simply because of its similar appearance to salmon although it is a whole different species from salmon. Chef Chok proceeded to give us a lesson on how to differentiate between salmon and trout. The Fjord trout grows to a weight of 2 to 5 kilos which is generally a bit smaller than salmon. The appearance of both fishes is easily identifiable when placed together. The salmon head is more pointed while the trout head is more round. The skin of the Fjord trout is quite similar to salmon as they both have lustrous and silvery colour. The body of the salmon is more slender compared to the trout which has a rounded and thickset body when compared to the salmon. The tail is also relatively different with the salmon being more forked while the trout is rather squared. Once filleted, the colour of the salmon and the trout is also easily identifiable. The colour of the trout has an appealing deep red-orange colour with white marbling that gives the fillet a luxurious feel while the salmon has a lesser sheen with the same red-orange colour. Fjord trout has a remarkably rich flavour with a pure aftertaste. They say once you’ve had a taste of Fjord trout, one might actually be converted to a full-fledge trout fan than a salmon one. Chef Chok procced to showcase on how to cook Fjord trout for his dish of Seared Fjord Trout with Mango Pomelo Salad & Thai Chili-Sesame Dressing. Trout fillet are best cooked with skin on and on low heat. First, cook the fillet of trout skin side down. The low heat will allow the natural oils of the trout to ooze out and this will help to eliminate the fishy aroma that comes from the oil. It will also help to extract the amount of oil from the trout which Chef Chok poured away from the pan and continue to cook the trout till medium doneness. Depending on the size and thickness of the fillet of the trout, the best way to feel the doneness is with one’s finger as advised by Chef Chok. Gently prod the side of the trout flesh and if its feels a delicate but lightly firm texture, the trout should be cooked to medium doneness. Should one opt to have their trout cooked to their liking of doneness, do proceed but the trout is best served medium doneness for optimized flavours and textures according to Chef Chok. Chef Chok’s perfectly medium cooked Fjord trout with crispy skin and soft moist medium doneness flesh looked gorgeously enticing at sight! Chef Chok’s dish is relatively easy to whip up with a few basic cooking steps. He makes cooking easier with the readily available sauces on the market and uses the Thai sweet chili sauce on this dish. The mango and pomelo salsa is also easy to prepare and takes only a few minutes of chopping and mixing. While there are rules in cooking, assembling the dish allows one to get creative. Chef Chok’s presentation was simple and really lovely. This final dish looked gorgeous and artsy elevating the gorgeous colours of the Fjord trout beautifully. The finishing touches of briny trout roes enhanced the moreish flavours of the dish. Sashimi time! Generous platters of sashimi of salmon and Fjord trout as well as smoked salmon and smoked trout was amazing. The flavours of the Fjord trout was sublime with delicate creamy and rich with a clean aftertaste. Salmon was delicious too but the trout flavours had a gorgeous richness that most of us enjoyed very much. Time to cook! My partner-in-crime was Alice from JomMakan as we paired up to reproduce the dish that Chef Chok showed us earlier. The ingredients are easily available and the dish was really easy to cook as it took us less than half hour to prepare and cook. We enjoyed the experience so much so that we even added some of our own touches on the presentation of the dish. It was also an honor as Alice and me had a photo taken with Her Excellency and Jon Erik with our dishes.